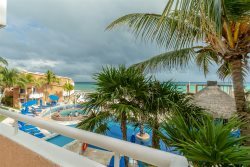 This condo is home at Sunset Fisherman´s Village Resort which is one of the top-rated locations in Playa del Carmen! Guests rave about this location compared to others in the area. Unit 225 boast many requested beachfront amenities including central AC, comfy premium bedding, sheets and towels, fully equipped kitchen, outdoor dining for 8 persons and indoor dining for 6, all within a tastefully decorated, modern tropically inspired setting. Sleep like a baby in any room comfortably as each bedroom has an en-suite bathroom, private 55” TV, ample lighting, seating and space to stretch-out. We offer our guest the option of personalized home provisioning services so, that you arrive with a stocked refrig of all your favorite foods and one mid-stay hotel cleaning is included. Fisherman´s Unit 225 is exceptional inside and out, it´s a spacious three bedroom, 3 bath property perfect for families, couples, or anyone seeking relaxation with a beachfront vibe. If lounging by the sea all day with spectacular unobstructed sea views from a private balcony, with cozy seating and living spaces is your idea of a memorable holiday- look no further. +Couples in particular enjoy this location – with a rating of 9.4. We speak Spanish and English too! We loved our stay! The condo and the resort are wonderful! Thank you for having us!!!! Great experience! The condo and the resort are wonderful! The service staff are friendly and attentive! We loved our time and will definitely visit here again! Don´t quite need three bedrooms? No problem..Ask for our one bedroom rates.